Greyland is a house west of Leyawiin (quest-related). It is the base for an illegal drug operation and home to skooma refiners. You will find it by travelling the road just a small distance south from the city's west gate and it will be on your right. 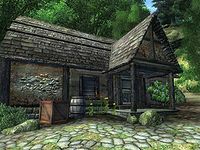 Once you have completed the quest concerning the skooma dealers, this house can potentially be used as your personal home. You can sleep in the bed, and everything in the building is legal to take. The one chest in the building (that initially contains skooma) does not respawn and therefore is safe for storing items. However, all of the other containers (the cupboards, drawers, and barrels) do respawn and should not be used to store any items. Also, every three days a Marauder will respawn inside the house and will have to be killed. While in the house, make sure to pick up the rare ironwood nuts. Raid on Greyland: Help the Leyawiin Guard get rid of a drug trafficker. Esta página foi modificada pela última vez à(s) 07h05min de 13 de janeiro de 2013.